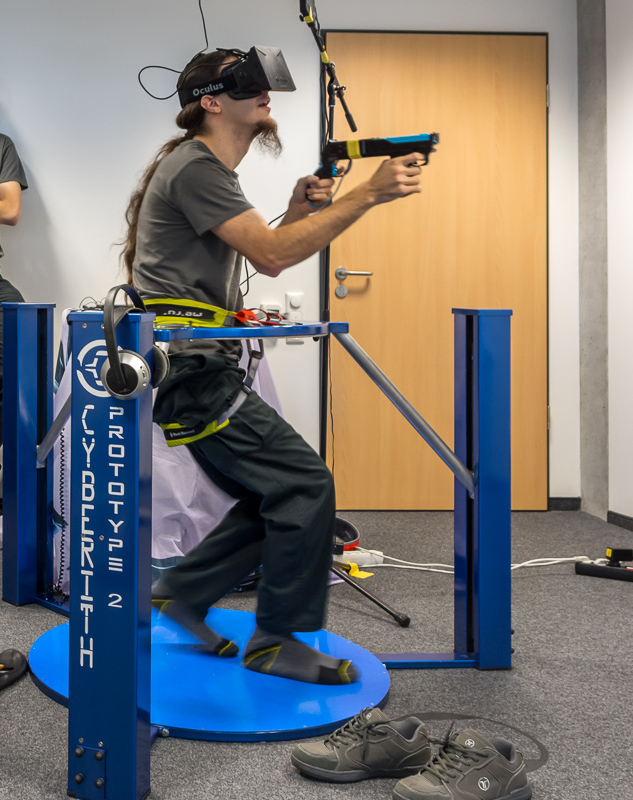 I recently had a second chance of testing the Cyberith Virtualizer after a first quick run with it at gamescom in cologne earlier this year. But this time in a more relaxed environment with much more time to try it out and chat. In case you haven’t heard of the Virtualizer yet, it’s an omnidirectional treadmill meant to be used for virtual reality applications. A device which you step into to “walk” around a virtual environment (which gets presented with a head mounted display, in this case the Oculus Rift). When I say walking you have to understand that you never really move around, like on a treadmill where you can run without ever moving more than a few centimetres, you’ll basically just move your legs. Luckily the hype around the Oculus Rift started a new hype for VR in general and currently two companies try to bring the concept of the omnidirectional treadmill to the gamers – for a more affordable price. The one is the Virtuix Omni which I could not yet try out and the other is the already mentioned Cyberith Virtualizer. To use the Virtualizer you have to get into the lower part of a climbing harness inside of a metal ring. You stand on a flat platform in cotton socks (to get the right amount of friction) on which you then make your normal walking moves. The mounting point of the climbing harness is fully movable: you can not only rotate around but also duck and even jump just as you would do in the real world. Some practice is needed to get the right feeling for it as the surface has an unfamiliar low friction. While I could only try out the Tuscany demo at gamescom, this time I had the chance to spend some time in City 17. Walking around in the virtual environment of Half-Life 2 and fighting Combines and Antlions with a riffle build out of a WiiMote really enhances the fun and immersion. Even compared to just using the Rift with mouse and keyboard. Controlling the character – or better: controlling yourself – in the game is a bit harder for two reasons: On the one hand the unfamiliar device you are strapped into, on the other hand the analog input into the device fitted to the digital control scheme of the game. Let me explain what I mean with this: You can move at an arbitrary speed (even run if you like) and duck to any height you are physically able to do. But the game only knows three speeds: standing, walking and running. It also only knowns two heights: standing and ducking. Games which support a more analog way of input should be even more immersive. Only with such adjusted games we will really see how good a treadmill really works. The Cyberith Virtualizer Prototype 2. One thing that didn’t work well in the treadmill but is highly related to the uncoupling of motions is strafing: It’s possible but not easy to do in the device. But when you think about it: it’s also not a very natural movement to begin with. In the real world you would rather rotate your lower body to walk in the desired direction while facing (and aiming) to the side. This however is quite easy and intuitive to do in the Virtualizer. The one interaction which still is problematic is jumping: In the current prototype you are not fixed into the harness tightly enough for precise jumps (at least in my opinion). The mechanics involved for jumps however will be completely redesigned to fix this issue with the third prototype currently under development. I’m curious how well this will work then. All put together I have to say that the Cyberith Virtualizer makes a good first impression – it’s fun, it’s a solid build and all in all its promising. Walking forwards and backwards is quite simple thanks to a flat surface to “walk” on and real ducking for cover definitely adds some immersion to the game :-D I also like the fact that it works with arbitrary cotton socks in contrast to the special shoes of the Omni – depending on your number of friends you would need a lot of different sized shoes… (for a research institute you would need even more!). I can’t wait to try out games that are better adjusted to the possibilities of this device – we definitely need fully adjusted demos to see all potentials – as well as drawbacks. I’m also curious if the next version gets the jumping to work better. (And I also hope to test the competitor in the future as well). Thanks for the blog entry, I’m really excited about the Virtualizer, but didn’t have a chance to test it yet. I’ve got a few questions with focus on the feeling of the device itself and not the game optimization. I’m really curious, as the movement with the Omni looks so much more natural: How does walking / running with the Virtualizer feel? Is it harder than actual walking/running? Do you feel it might be bad for your feet (malpositions)? It feels a bit like towing something as you are hold in place by the harness. It works well but of course it can’t be 100% real. Not sure if the Omni feels more or less natural, I didn’t had the chance to try that out. Walking on a flat surface could feel more natural, independent on how it looks – we will have to wait for someone to test both final versions to figure that out. Did it feel like you were sliding your feet on the ground, or like you were actually lifting each foot off the ground to move forward? You can lift your feet of the ground but while you move forward you are of course sliding (any ODT has to make sure that you stay basically at the same place). It was less realistic than walking on an actual treadmill, but I’m not sure if a omnidirectional treadmill can be make much more realistic without complex moving parts (keep in mind, I still did not have the chance to test the Omni). Having worked extensively with VR motion systems, I have argued this point many times. Strafing is a ridiculous FPS invention that has almost no useful analog to real world movement. If you force yourself to strafe in real life, you will quickly realize how awkward and rare it actually is. Almost all strafing in real movement is confined to a single side step (obstacle avoidance) – not a continuous side locomotion. Continuous side motion is instead handled by moving forward with your head/torso twisted to the side. Hello, this is a good review and still relevant. We wrote a Cyberith Virtuzalizer review / article on our blog: http://www.vrheadsetguide.com/cyberith-virtualizer-vr-treadmill/ . We’re really excited for this product’s broader release, which I hear is still scheduled for Fall 2015.